To assist with this need Dejero, provider of cloud-managed solutions that provides video transport and Internet connectivity while mobile or in remote locations, has been working with systems integration partner, Frontline Communications. Their combined objective is to deliver reliable connectivity to WLEX-TV by installing Dejero CellSat into a Chevrolet Traverse SUV, giving confidence to WLEX-TV field operators when sending video back to base. Dejero’s cloud-based management system allows operators back at the studio to remotely control transmitters in the field, monitor and route incoming video feeds, and view detailed performance data, leaving the remote crew to get on with the job of covering the story. Sam Gordon, operations manager, WLEX-TV said that with Dejero CellSat on board, unlike a traditional SNG truck set-up, there is no need to bring in specialist operators or pre-arrange a satellite slot. You simply put up the dish in case it’s needed, and it connects on demand — and only when the cellular signal alone isn’t strong enough. 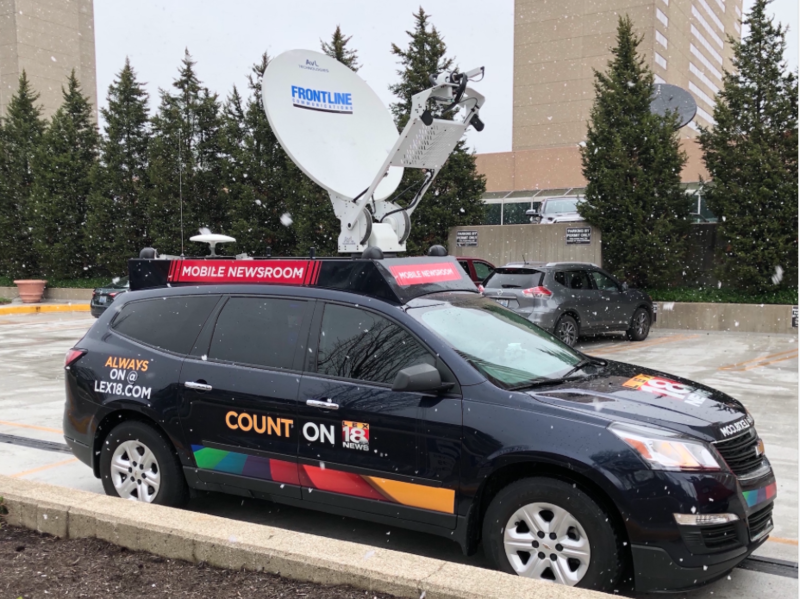 WLEX-TV has found the ideal combination of reliability, flexibility and simplicity with their SUV outfitted by Frontline and equipped with Dejero CellSat. Its crews and field reporters can be on location quickly and get connectivity from virtually anywhere in order to be the first to broadcast breaking news, even when operating in congested cellular locations such as at the Music City Bowl. Providing enhanced reliability in situations where cellular networks are congested or cell coverage is limited, Dejero’s award winning CellSat leverages the company’s patented network blending technology to improve reliability by combining cellular connectivity from multiple mobile network carriers with Ku-band IP satellite connectivity provided by Intelsat. Intelsat (NYSE:I), provides integrated satellite communications with approximately fifty satellites worldwide. If available cellular bandwidth dips, up to 7.5 Mb/s of additional satellite bandwidth is automatically provided—that is sufficient to deliver exceptional picture quality, even if cellular connectivity is lost entirely. It enables broadcasters to manage their transmission costs by using cellular when available, or CellSat when extra reliability and quality are desired. Frontline Communications claims to be an industry leader in building broadcast, mobile command, and specialty communications vehicles. Working with vehicles from small SUV’s to tractor drawn 53-foot trailers, it was ideally qualified to take the Chevrolet Traverse SUV, a mid-sized SUV, and convert it into a mobile remote production facility, using Dejero CellSat. Gordon added that they have a full remote production facility connected directly to the studio, plus anyone can jump in and drive the SUV as there is no need for special licenses. In December last year, WLEX-TV covered the Music City Bowl, a popular post-season American college football fixture that takes place annually in Nashville. Gordon continued that although the Nissan Stadium in downtown Nashville which usually has solid connectivity available, with somewhere around 70,000 fans, they figured that the cell networks could get overloaded — so they needed a backup. CellSat gave us the extra confidence that they wouldn’t lose connectivity during a live shot. It worked perfectly for their operator. Back at the station, they couldn’t tell whether the video was coming in via satellite or cell; the picture quality was that good. The latency was also just like any other cellular shot that they have done. Launched in August last year across North America, CellSat made its NAB debut earlier this month and won the IABM Broadcast and Media (BaM) award in the ‘Connect’ category. Rollout in other geographies is planned for 2018.